Geez, I'd feel worn out if anybody nagged me about getting married, but my boss? I'm here to work dammit!! He shouldn't have told him until the wedding and been like, "oh, did I not tell you I was getting married? I guess you never brought it up." Vanilla Gods solve both problems by using "Reunion" on Akira and Daisuke simultaneously ..... "IT'S SUPER-EFFECTIVE!" "And There Was Much Rejoicing ..... YAY!" Hmm, so in reality, his boss bugging him about getting married was him being a wingman...? "She's still indirect as always, how cute?" Why yes...I'm inclined to agree that she is quite adorable. And of course, the right thing to do is always to take proper responsibility! Great ending. Considering he mentions he plans to marry her, it's good to know that he did indeed take responsibility. And considering all the encouragement of the wingman boss, I'm sure he can expect an invitation to the wedding! 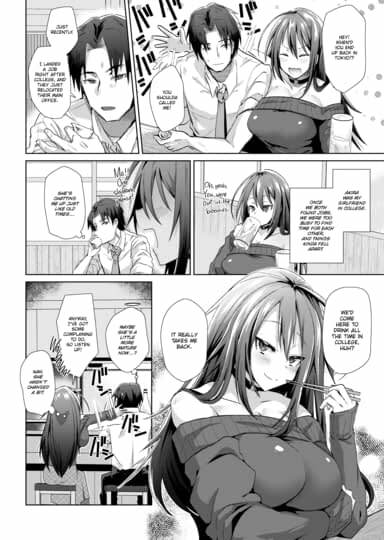 Fate, alcohol, and the gravity-defying sweater.